of culture in Northern California. Visiting a local chess club is a great way to meet and play other chess enthusiasts. Clubs are open to drop-in players and have an informal atmosphere. Some clubs do offer weekly USCF rated tournament-style play along with casual games. If you are thinking of visiting another state and looking for a chess connection there, we have created a map with links to the various other USCF state affiliate websites. It encourages the search of the best move, the best plan, and the most beautiful continuation out of the endless possibilities. It encourages the everlasting aim towards progress, always steering to ignite the flame of victory. You will make life-long friendships with people you meet through chess. You can learn to play at any age and in chess, unlike in many other sports, you don't ever have to retire. Age is also not a factor when you're looking for an opponent --young can play old and old can play young. Chess develops the scientific way of thinking. While playing, you generate numerous variations in your mind. You explore new ideas, try to predict their outcomes and interpret surprising revelations. You decide on a hypothesis, and then you make your move and test it. Chess is a test of patience, nerves, will power and concentration. It enhances your ability to interact with other people. It tests your sportsmanship in a competitive environment. 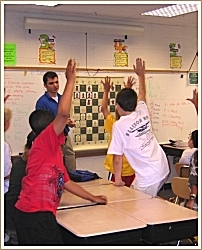 There have been numerous studies showing the positive effects of including chess as part of a child's school program. If your school does not already have an after school program or club, START ONE! Contact one of the above programs and they will assist you. The following individuals offer private chess lessons to players who desire to take their game to the next level.